It is our pleasure to announce that the 2019 3rd International Conference on Consumer Electronics and Device (ICCED 2019) will be held in Southeast University Liu Yuan Hotel, Nanjing, China during June 13-15, 2019, co-hosted with ICCSS 2019. The conference is organized by International Joint Research Laboratory of Information Display and Visualization, Southeast University, China, Jiangsu Vacuum Society, and Asia Society of Researchers. The topics covered by ICCED 2019 include, but are not limited to: Automotive Entertainment & Information, AV Processing & Streaming, Embedded Technologies, Enabling Technologies, Mobile Computing & Communications, etc. ● After a careful reviewing process, all accepted papers after proper registration and presentation, will be published in the ICCSS 2019 IEEE conference proceedings as a special chapter, and submitted for included in IEEE Xplore, Ei Compendex and Scopus index. ● After conference, some selected papers, after content extention (at least 40%) and peer-review, will be recommended to be published in IEEE Transaction on Electron Devices as regular papers or other journals with impact factors. The journal information is as follows. Note: If your paper passed the peer-review and accepted by the journal, additional publication fee is requested to pay to the journal. 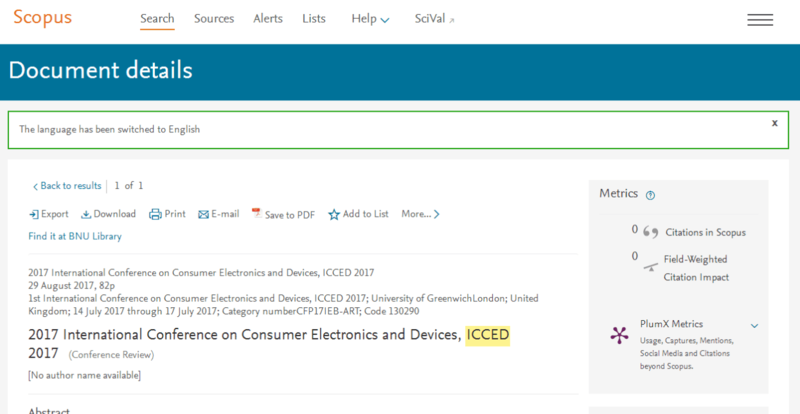 Dec. 23, 2017｜ICCED 2017 conference proceedings has been indexed by Ei Compendex and Scopus. 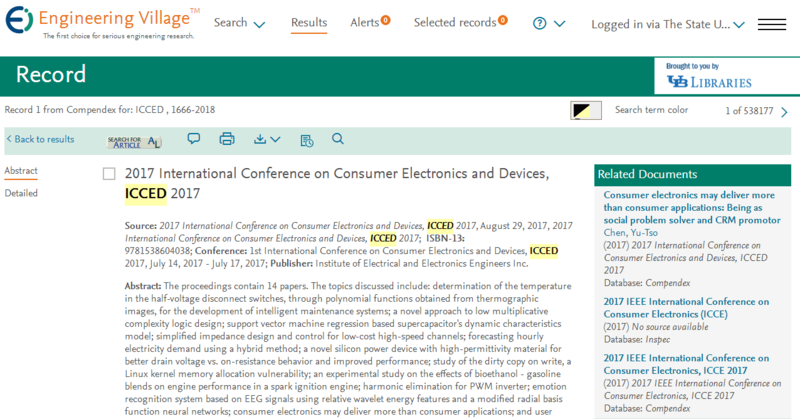 Sep. 4, 2017｜ICCED 2017 proceedings has been included into IEEE Xplore.